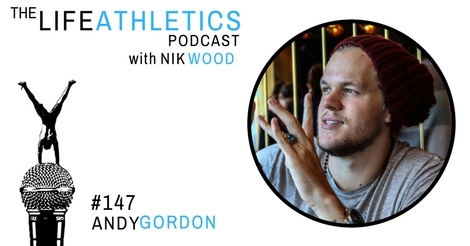 Hey Life Athletes, welcome to episode 147 of the Life Athletics podcast! Today’s guest Life Athlete is Andy Gordon. Andy is a coach, a consultant, and a creator who is going through an amazing transition in life. Setting aside his coaching career, for the time being, he revisited his dreams when he was younger. He went out of his comfort zone and entered the unfamiliar world of music, photography, and film. Surely, he has found happiness and fulfillment in this new path. This episode talks about his journey in finding his passion while leaving behind what’s comfortable for him. He encourages everyone to do what they want in life and to do them not for others but for themselves. It is not wrong to start something different because as long as your heart is in it, it will always draw a smile on your face. He recounts his experiences after becoming homeless and how he overcame that misery. He realized that looking into the bigger picture of life while appreciating little things can bring happiness. At the end of the episode, he gives an inspiring message for all the life athletes on how to win in life. Just do what you love and enjoy life!